I was super excited when I heard Twilight Time was going to be releasing Baby Boom. 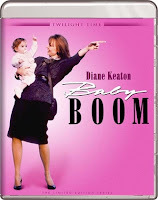 Baby Boom is one of my favorite comedy’s. Keaton is priceless in this. I laugh and watch this movie over and over again growing up. It truly is a priceless comedy and a comedy I feel is often over looked and that is a true shame. I am so glad that Twilight Time choose to honor this film on a Special Edition Blu-ray. I am doing a double bill showcase. Reviewing two wonderful comedies, both brought out on wonderful high quality Blu-ray’s. Amazing transfers to high definition and gorgeous 1080p reality. I am doing a Double Bill because both are comedies that I return to repeatedly and both have been seen by me probably more than a hundred times. I love both films with a passion. Starring the amazing Diane Keaton. Keaton has been a part of so many amazing movies and in my viewpoint when Keaton joined with Woody Allen, for in my own opinion, one of the greatest comic films to date, and that’s Annie Hall. Diane Keaton is another one of those persona's that needs no introduction. She has always graced cinema with a flawless example of just how a performance can shine, and her role in Baby Boom is no different. She has been a part of cinema for many years, and her talented ability to own her characters, and basically become them, shines in anything she does. I know that I speak a lot about certain actors and actresses who own their characters, but to me, that is the example of how good a performer they are. They are not just acting out a job, that they have been paid for, they become the part and express a true passion. The flawless actors and actress’ are those, who look at a part and own it. They breathe it, enter its soul and possess it; that is what Keaton does. Keaton is one of those performers that in my viewpoint goes up there with all the greats of the past and present. From starring in the greatest films like The Godfather series, to the many Woody Allen films, she is a goddess of performance. She deserves all the recognition she can get. Her ability to perform with Woody Allen is priceless in many of his films from Sleeper, to Annie Hall and many, many others, including Love and Death and Interiors. She not only is an actress but also a director. She is a multi-talented person of cinema that is gorgeous to watch in anything she does. Baby Boom is directed by Charles Shyer. Shyer is a unique director that has not directed many films, but has directed a few that truly stand out and are memorable in the comedy world. Baby Boom in 1987 which I feel is his best. But he also directed two Steve Martin favorites of mine. Father of the Bride, and Father of the Bride 2. Shyer not only directs but produces films and TV projects. I feel he left a great stamp with Baby Boom, for it never gets old watching it. I have seen it so many times, and love it every time I view it, and now I can view it on a wonderful amazing high quality Blu-ray that Twilight Time has put great excellence in. Baby Boom is about a career woman, driven by her work and job in Manhattan. Soon everything’s is turned upside down when she inherits a baby. She loses her job, her boyfriend, and she ends up moving into a house both beautiful and yet falling part. So, begins her new life as she struggles in one comical reality after the other. Second feature of this Double bill, and second release on Special Edition Blu-ray by Twilight Time. How to Succeed in Business Without Really Trying. This is another fun comedy mixed musical that always lingers, and is one of those movies you can watch repeatedly and enjoy it the same every time. This is based on the 1961 stage musical that has the same name. What is so good about the film is the original cast members Robert Morse and Rudy Vallee star in the same roles as their Broadway characters. Robert Morse is a pure actor and singer that remains one of the coolest and spectacular personalities in the film world. He is an actor that shines and is one of those performers that is a pure treat to watch. As I have stated also starring the amazing Rudy Vallee. A pure musician and actor and all around guru of achievements. Singer, actor, author and most of all entertainer. He left an amazing career of one of a kind moments in both film history and music history, and he is a personality that should always be remembered. He was a one of kind master talent, and it was a grand treat seeing him in this again. The wonderful and amazing Michele Lee also stars in this. Lee was and is a fantastic singer, dancer, director and so much more. She has left a career of wonderment on her part. From Broadway, to feature film, to Game Show personality. Her stardom remains a passion in film and small screen history. From the amazing Stage performances, to the many wonders of film. She has been nominated, and awarded for her passion over the years. It was great seeing her in one of her first roles on screen. Directed by the one and only David Swift. Sadly, he passed away in 2001 but left a wonderful career of films. He not only was a director but he wrote, produced and animated. He directed many of my childhood favorites, 1960’s Pollyanna, 1961’s The Parent Trap. He had away with showcasing his performers in a believable way that display a personality that the viewers could relate to. Simply put, his characters came to life in a true way. 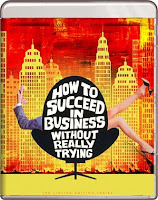 In How to Succeed you are introduced to a young window cleaner J. Pierpont Finch who buys the book How to Succeed in Business, following the book advice, he decides to join a business known as the World-Wide Wicket Company and starts working in a mailroom. The advice from the book seems to work or at least Finch seems to be following the process written. Soon he finds himself rising in the work place by becoming Vice President in charge of Advertising making all kinds of changes throughout the company. Soon Finch starts to fall in love with Rosemary Pilkington who is a secretary. Finch finds his trip through the world of Business one odd and strange obstacle after the other, all in one comical reality after another. Both are fine, and are wonderful examples of how to treat older films and express them on new amazing outlets for a new generation to experience. Both are fantastic in imagery and sound. Each contain a wonderful transfer to High Definition and 1080P. Isolated Music & Effects Track : The man behind the music is a genius. Composer and conductor William Bill Conti. A master at music. A master at memorable film scores. He is one of the best. All one has to do is look at his memorable career or catchy tunes, the Rocky soundtrack, need I say more. Also for the James Bond classic, For Your Eyes Only. The Karate Kid. He did the soundtrack to one of my favorite underrated films of all time the amazing 1993 crime drama Blood In Blood Out (which needs a special edition, limited edition blu-ray). Conti is a master at creating tunes and music that just remains with you all your life, I mean who doesn't know the Rocky soundtrack. After watching and hearing his music in the films, you remember them, hum them and just know them. This is a great special feature. Twilight Time honored this master with this special feature. Audio Commentary with Film Historians Julie Kirgo and Nick Redman. Yet again a flawless commentary by two amazing persons. Two film guru’s that I highly praise and respect and enjoy hearing from each time these extras are given. Both have a true passion for film and that is what counts perfectly. Isolated Music Track (with some effects): The music was done by two persons. The songs are written by the amazing Frank Loesser, and the music is done by the equally amazing Nelson Riddle. Frank really needs no introduction. He wrote the lyrics for so many wonderful Broadway musicals. Nominated for 5 Academy Awards in Best song. He created so many memorable musical moments that linger with the viewer. From the one and only Guys and Dolls to this one I am reviewing. A pure master. Riddle was another musical master, an arranger, composer, band leader, among many other titles. All one must do is look at his amazing career working with so many amazing singers and stars from Nat King Cole to Frank Sinatra. The amazing Judy Garland, Dean Martin, and many, many others. A true golden ticket. It was amazing hearing this extra on this Limited Edition, Special Edition Blu-ray. This Book Is All That You Need: Robert Morse on J. Pierrepont Finch. This has a running time of about 19 minutes. I really loved this feature. It was great hearing from Morse. It truly is a fun listen and watch as he reminiscences on his career. A Secretary Is Not a Toy: Michele Lee on Rosemary Pilkington. This has a running time of a little over 16 minutes. This too is an awesome and fun listen. It’s always a treat listening to Michele Lee. She talks about the musical and her many memories. Yet again Twilight Time has brought out two amazing Blu-ray’s on High Quality, High Definition, 1080p clarity and total beauty. I highly recommend both films. Twilight Time always blesses the movie loving world with top notch products. Both films look amazing, sound amazing, and are perfect to own. Get these Special Editions, 3,000 Unit production why they last. Two perfect Blu-ray’s to add to your collection.